TME now also offers the latest HMI (Human-Machine Interfaces) solutions - high-quality modules for EVE3 smart displays produced by RIVERDI. They are based on the latest line of BRIDGETEK graphic controllers, BT81x. Powered by the EVE technology (Embedded Video Engine), which combines video, audio and touch features, they offer easy application of graphic and video solutions. Technology used in EVE3 gives us improved display quality, SPI performance and possibility of extending the memory (as well as decreasing power drain). Thanks to these attributes implementing them in the systems is easier and the solutions are more efficient. 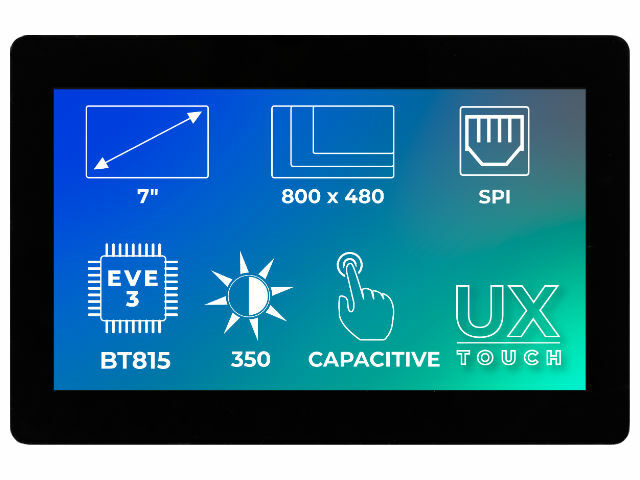 Screen size 3,5" to 7"
Discover the offer of EVE3 displays manufactured by RIVERDI available at TME.